What was once a brisk, empty lecture hall immediately emerged into a warm, welcoming environment. Esther Robinson brought a sprightful joy to the room. Robinson immediately took an interest in the audience; she was intrigued by what motivated the crowd to be present that night and by what drove them to create art. She joked in a lighthearted way that made it hard to lose interest. However, she was serious and impregnated with knowledge. Robinson is a dedicated member of the art, philanthropy and business communities. 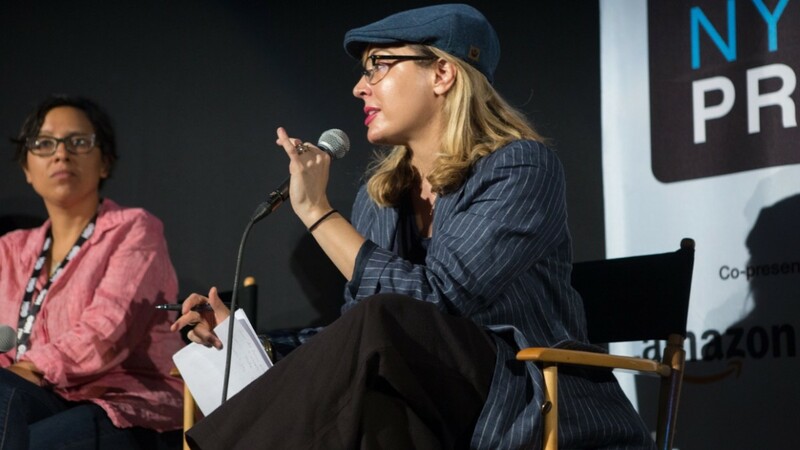 After receiving a degree in film and television from New York University, she has worked for a variety of magazines, film companies and nonprofits. In 2006, Robinson founded ArtHome, which creates new resources and activates pre-existing asset-building programs to assist individual artists to create personal solvency. Most recently, Robinson has been serving as the co executive director of ArtBuilt, a nonprofit that provide long term, affordable workspace for artists and art-based businesses as well as asset-building strategies and financial literacy training for artists and creative business people. As an artist, Robinson acknowledged that it is easy to self-isolate and to think that one’s individual problems are only their problems, which is a natural problem for any individual. However, she advises upcoming artists to recognize their place and role in society and to take a stance against that feeling of disconnectedness. Even though creators of art are not immune to the pressures of society, they are also not alone in that feeling of oppression and hopelessness. She challenges artists to channel that oppressive feeling into work, to use art as “liberation of dehumanization.” It was this kind of positive encouragement that made the lecture enjoyable; she seemed to take a genuine interest in the way young artist begin to find their craft and place in the world. Robinson acknowledged that as an artist it can be ghastly to claim your place in the industry, but that is no reason to walk away from your passion; rather it all starts with validation. It is the moment where one believes in themselves and their own craft that others will begin to see that individual’s potential. She warns against seeking validation in others, because society is a cruel and unforgiving place. Rather, she advises garnering a group of trusted individuals that will provide honest feedback to help the artist continue to develop. Robinson says that once an artist begins to seek validation in others, they become “exceptionally exploitable.” When someone fails to see their own greatness, others will recognize them as a shiny penny and drain them of all their worth. This was powerful because it is easy to look to experts in the field for counsel under the impression that they want to pass on the breadth of knowledge, or that they want to see the next generation do well. However, it is not judicious to always assume the best in people. In addition to all of the purposeful advice Robinson breathed into the room, she spoke of love. This was the most potent advice because it makes the artist question their entire drive for creating. She challenges artists to ask what it is they love. Knowing what one loves gives them a reason to wake up in the morning; it gives an individual something to strive for. Sequentially, she encourages artists to question how they know what it is they love. By knowing how they are positive they love something, it gives them a reason to fight for it and creates that fear of losing it. And once they know how to protect what they love, they will be unstoppable; it prevents the misfortune of ever losing it. Lastly, Robinson encourages artists to build their world around what they love. This teaches them how to generate a life that enables them to live in financial stability, emotional stability and still have the space to create innovative work.